Technology exists to make our life easier...and today with our smartphones and the internet, most of the major problems students used to struggle with are a thing of the past. Are you having trouble staying organized? Problems keeping track of your money? Do you get distracted way too easily? After procrastination, distractions are a student’s worst enemy. News feeds, notifications, status updates...these all take up precious time you could be using to actually get things done. So in case your willpower isn't enough, some genius actually invented an app for blocking certain distracting websites for a set amount of time. Once you’re done being productive, you can get back to all your favorite websites! Why would you need to actually BUY a textbook when you only need it for one semester? Don't spend hundreds on textbooks, just rent them from Amazon and them ship them back free at the end of the course. Sorry Microsoft Office, but when it comes to having documents you need to access from anywhere, Google takes the cake. Documents, spreadsheets, and presentations are all extremely easy to make online through Google Drive, and everything is stored in the cloud without you having to click save every 5 minutes. Just because you have to-do lists doesn't necessarily mean that you’re organized. The beautifully designed app Clear syncs all your reminders and to-do’s with other devices so you can easily read and manage them wherever there is internet. Ever find that you’re surprisingly low on money but you have no idea where it went? You’re not the only one...which is why Mint.com helps you easily control your budget and see what you’re money is being spent on. Maybe with this you’ll actually have something to show for it this time. You walk into class and the teacher announces she’s collecting the homework...now you’re asking yourself “What? What homework?”. Oh yeah. You forgot. Now you have no excuse for this thanks to myHomework App. Just enter the information about your class, professor, assignments, etc. and the app will remind you about it just in time. Need to making citations for your references? Who even remembers how to do those? Go to Bibme, enter a book’s title or a website URL, and BOOM your citation is made in a couple seconds. Seriously, it seems a little absurd that people pay thousands of dollars for a college education when there is such a thing as iTunesU. This incredible section of iTunes actually gives you FREE access to entire courses from renowned universities like MIT, Oxford, Yale, Harvard and Cambridge. Browse the courses and learn all the fascinating information WITHOUT actually having to do the homework! Ever been assigned to read an entire book but you were just too lazy to read the whole thing? CliffsNotes provides you with information about the plot, summaries of every chapter, analysis of the characters and more. There’s even an audio version so you don’t have to read anything at all, you can listen to everything while taking a walk or just relaxing. Can’t find something in your local library? Well welcome to the world’s largest online library: Scribd. This helps students find millions of books and documents which are shared by people from all over the globe. You can even create your own library with your personalized notes and books that you need quick access to. So there you go, you now have 10 less excuses for not doing good in school. Just remember that ultimately, the only person responsible for your academic success is YOU! 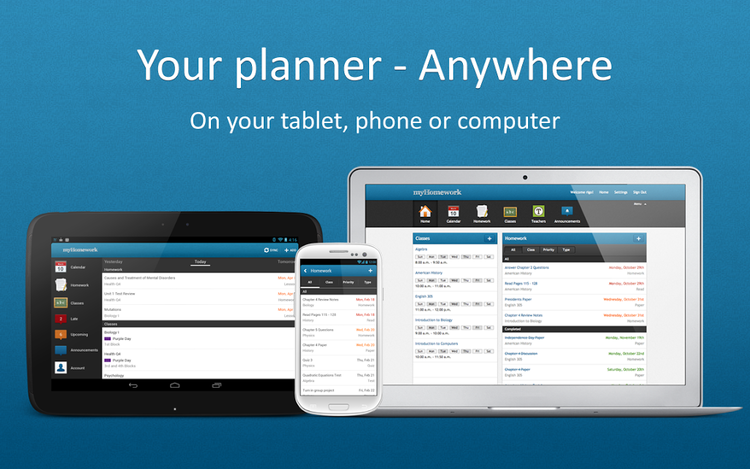 Know about any other useful apps or websites that help you stay on track?